I have a little issue in my own SiteCatalyst setup that I recently discovered. Sad for me I had trusted the number of Orders for each day’s Conversion Funnel and recently I decided to validate the numbers in SiteCatalyst against what our back-end system has. SiteCatalyst is 5%-10% understated each day which makes for a heck of a difference at the end of the month! I’d rather be understated than overstated, but can you give me some ideas where I should look first? Unfortunately this is an all too common problem I hear out there. In this post I am going to share some ideas on how you can tackle this Order/Revenue validation issue head-on and make sure you can trust your critical Orders/Revenue data in SiteCatalyst. 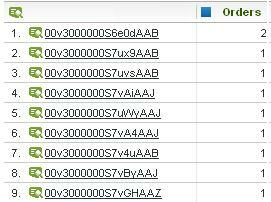 In the example above, we can see that most Orders have only one Order ID, which is what we want. However, in this case, we can see that one ID was counted twice. That may require some research and I like to schedule a report like the one above to be sent to me weekly so I can make sure nothing strange is going on. However, while adding an Order ID eVar is helpful in seeing if you are over counting Orders in SiteCatalyst, it won’t tell you if you are under counting Orders or how close your SiteCatalyst data is to your back-end systems. To do this, I recommend you use Data Sources. As a quick refresher, Data Sources allows you to import external data/metrics into SiteCatalyst (see post link for more details). In this case, I recommend that you import in a file from your back-end system into SiteCatalyst which contains your unique Order ID, the number of Orders (which should always be “1”) and the Revenue Amount. When you import data via Data Sources, you include the date that you want the data to be associated with so it doesn’t matter if you import the data on a daily, weekly or monthly basis, but the more frequently you upload it, the better so you can find issues quickly. Create a new Data Sources upload template (ClientCare or Omniture Consulting can assist with this). You want to be sure to map the two new “Back-End” Success Events to the Data Sources template. Even more critical, is that you want to include the newly created Order ID eVar in the Data Sources template. 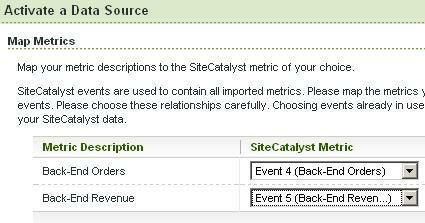 If you do not do this, then you will not be able to see these two new Back-End metrics in the same Order ID eVar report that you have in SiteCatalyst (more on this later). Now all you have to do is work with your developers to have this file sent via FTP to the Data Sources FTP on a regular basis. So by now, you are probably saying to yourself: “That’s a lot of work!” No argument here! However, hang with me as I share what the ultimate payoff is for doing this. As you recall, our primary objective was to see if our online Order and Revenue data was matching what our back-end systems indicated. Now that we have the Order ID eVar and two new “Back-End” Order and Revenue metrics, we have everything we need. This is where the fun begins and we put it all together! Cool huh! As far as SiteCatalyst is concerned, these offline metrics are connected to your Order ID eVar values just as if they had happened online. Using this report, we can see if there are any differences between our online and offline data. In the example above, it looks like the “Back-End” system had an order with $2,350 in revenue that wasn’t captured online. Having this information makes it much easier to troubleshoot order submission issues. You can even use DataWarehouse or Discover (only if you use Transaction ID Data Sources) to break down Order ID by browser, domain, IP address, etc… to see if you can figure out what is happening. In addition, you can export this data to Excel and look at the totals to see how far off you are in general. Finally, for the true SiteCatalyst geeks, you can create a Calculated Metric that divides Orders by Back-End Orders and/or Revenue by Back-End Revenue to see a trended % that each is off and set up Alerts to notify you if they deviate too much! When you take into account this level of assurance all of a sudden the Data Sources work above might not seem like all that much in the long run! If you sell products online, nothing is more critical than believing in your key metrics. Even if you don’t sell online, the same principles here can be applied to lead generation forms, subscriptions or any other metrics you store in SiteCatalyst and also in your back-end systems. Thanks for this post, as always. Helped me see a different benefit of Data Sources. If your goal is to validate online orders, make sure you (or your developer or database person) is only pulling the ONLINE orders from your back-end system. If you also have orders in your back-end system that are phone orders, catalog, bulk orders, etc. (any NON-online orders) and you input those as part of the validation of your online orders, you will guarantee a mis-match between what Omniture has and what your back-end system has. Great point! I had taken for granted that people would only import ONLINE Orders from their back-end, but I should have stated that more overtly. Thanks!! Creative recommendation. I like it. One thing I’ll add that could help minimize the 3-7% variation between SiteCatelyst and the backend system is utilizing the data insertion API on the confirmation page. I’ve seen this take retailers from 3-6% ‘off’ to less than 1%. Good stuff. This is incredible! Is it then possible to attribute the order id to the referring source? I am in the process of tying order id’s to a customer database and I need to calculate the all time unique customers to their referring source. Great post as usual. A simple question though. How do you setup an alert for a calculated metric in sitecatalyst 15? I’ve looked in the Calculated metrics report but the alert button is missing from its usual place. Any ideas, where it went? If you are seeing a discrepancy between orders reported in Omniture and those coming out of the back end system, how would you go about troubleshooting the cause of this?